At the time of the First World War, women were not able to serve on the front lines. Despite this, many women found unique and inspiring ways to contribute to the war effort. The women of the Voluntary Aid Detachments were one such group that made an invaluable contribution—here’s their story. Voluntary Aid Detachments or nurse? Voluntary Aid Detachments (VADs) and nurses are not the same. 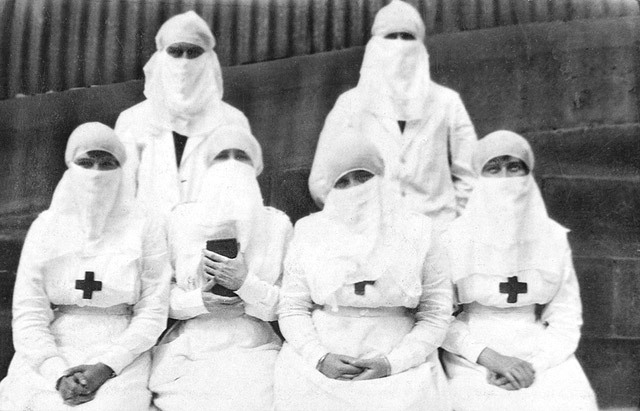 During the First World War and after, VADs were popularly known as Red Cross Nurses. “Nurse” or “sister” was commonly used in and around military hospitals by both staff and patients. However, VADs only held certificates in first aid, home nursing and invalid cookery—unlike nurses who trained for 3 years. There was frequent resentment from the nursing profession because the title implied VADs were fully trained and equal in skill and knowledge. How could you tell them apart? In the early days of 1915, VADs wore a “Sister Dora” stiff triangular cap. However, in an effort to placate professional nurses who were already unhappy at having to work alongside ‘amateurs’ in wartime, the military authorities introduced a new type of cap for VADs to make them easily distinguishable when in uniform. The handkerchief style cap tied at the nape of the neck was introduced and became strongly associated with the Great War VAD. In this photo, the VAD is on the right of the wounded soldier. Image: Great War photos. In the early days of the First World War, Australian military authorities restricted VADs from serving overseas. However, in 1916, while living in Brisbane, Queenslander Lydia Grant decided to join Red Cross and go directly to the war zone with her friend Jean Darvall and several others. They left with high hopes of easing the suffering of wounded soldiers in England. On arrival in London, Lydia was kitted out with a uniform and equipment, and allotted to the military hospital in Manchester. Early reports in her letters showed she was very happy and keenly interested in her work. That year, Manchester experienced one of its coldest winters and Lydia contracted measles. Sadly, she passed away in April 1916. Lydia Grant’s story was similar to that of many VADs serving in both Britain and France under conditions which damaged their health. Mourned by both her family and the Red Cross, Lydia was one of the rare Australian volunteers of that time who paid for her humanitarianism with her life. 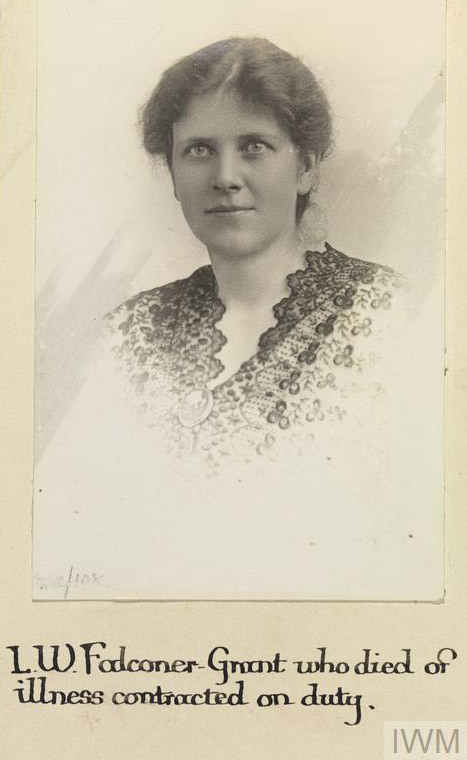 Portrait of Lydia Grant, who served as a VAD in England in 1916. Image: Imperial War Museums. Popular culture finds its origins in many places. The trenches of the First World War may have been one of these. Soldiers wounded on the Western Front were stretchered back to casualty clearing stations where army nurses and Red Cross VADs were waiting to save lives and ease pain. Once the wounded had been transported back to military hospitals and convalescent homes, the VAD played a key role in their long-term recovery. 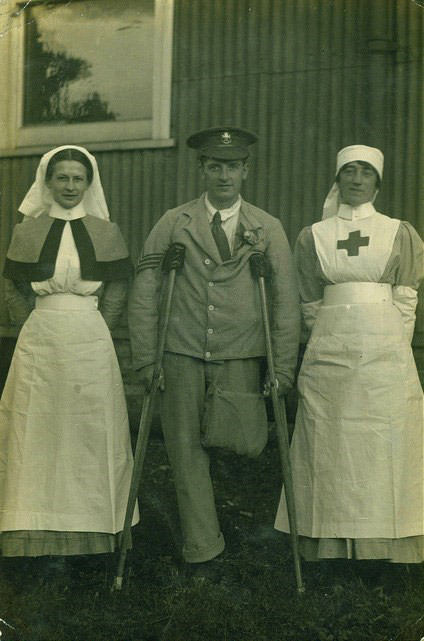 Soldiers were grateful for this care and the sacrifices these women volunteers made every day to help them. A song called Rose of No Man’s Land captured this gratitude. It was written by Frenchman Leo Feist in 1918, and its widespread popularity translated into a traditional style tattoo. 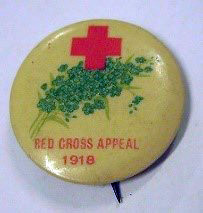 The Rose of No Man’s Land motif consists of a vintage-style head of a young woman wearing a Red Cross veil with a large Red Cross in the background. She is usually nestled in the middle of a red rose. The tattoo design remains a symbol of everlasting appreciation for the caregivers of the world. With the rapid spread of the deadly Spanish Flu in Australia, governments passed restrictive laws to protect the population. Wearing face masks was made compulsory, and people could be arrested for not complying. The Red Cross played a vital part during this terrible era by supplying over 700,000 masks to the public. More significantly, Red Cross called on its “army” of VADs who were already trained in first aid and had been caring for returned Anzacs. There were 9,570 influenza cases reported in Brisbane and 11,099 in other parts of Queensland. VADs (like those pictured below) worked in quarantine stations and in hospital isolation wards to ease the suffering of affected citizens. Over 12,000 Australians died during the epidemic, including 5 VADs. This extraordinary photo from 1919 gives a window into a time which today would be inconceivable. Image: Springwood Historians. Although it was not the national flower of Australia at the time, the wattle became a part of the Anzac experience during the First World War. Family members sent sprigs of wattle in letters to the front and soldiers wore them in their helmets as reminders of home. Traditionally, wattle was placed with fallen Australian soldiers before burial. The flower is also depicted on many Australian Defence Force medals, colours, standards, guidons and banners. The VADs also found uses for the bright yellow sprigs. When soldiers returned to Australia, VADs greeted ambulance trains by handing out bunches of wattles and cups of tea. They would also use wattle for fundraising during fetes as a means of raising money for organisations such as the Red Cross. Thank you to the Red Cross for developing and sharing these resources. You can also read the latest edition of Salute for details of their recent Queensland Anzac Centenary grant project, which details more fascinating aspects of Voluntary Aid Detachments history.